The City of East Bethel is responsible for maintaining and operating three cemeteries: East Bethel Cemetery, Oak Leaf Cemetery, and Old Bethel Cemetery. 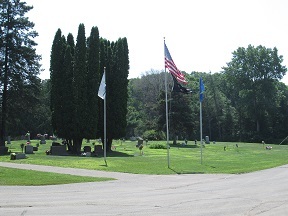 Frisborg Cemetery is also located in East Bethel, and is privately managed. The City is responsible for selling and the recording of all plots. The City also opens and closes all plots. Fees for plots, plot digging, and other services provided at the city cemeteries are established in the annual fee schedule adopted by the East Bethel City Council. Cemetery visitors will be allowed in the cemetery from sunrise to sunset. No pets are allowed on the cemetery grounds. No motorized vehicles will be allowed off designated roadways at any time with the exception of City maintenance personnel, monument setters, and vault company employees. Disturbance of the tranquility of the cemetery by noise or other improper conduct is not permitted. All visitors are reminded that the cemetery is considered sacred ground for the deceased, and that a strict observance of all properties and respect due such a place shall be required. For more information, see the City of East Bethel, Cemetery Regulations. We have provided maps of all three cemeteries for informational purposes. Staff has been provided the information for these maps and does their best to keep them up-to-date. If you find any errors or have additional information, please contact us. If you have any furthur questions, please call City Hall at 763-367-7840.